The Inter-School Novel study is project that happened by accident last school year. And when Alec set the assignments for this class, I knew that this is what I wanted to do as my final project. Although it is not necessarily something “new”, it was a project that I needed to refine and enhance using digital tools I learned about here in this class. But first, here is some background on the project. The Inter-School Novel study began when I borrowed a novel set from my former school for my class of Grade 7 and 8s. Little did I know, the day after I borrowed them, the brand new 7/8 French Immersion teacher at my former school, Scott Motlik, went looking for them too. This lead to a great discussion between the two of us and how interesting it would be to have our two classes from two very different communities read the same book. So, I asked my librarian to buy a set of the novels and, while we waited for them to arrive, Scott and I planned our novel study. Scott and I are both into technology and the use of technology with students. However, one big difference is that in my community, almost every child and their dog has some sort of internet ready device. In Scott’s community, most students don’t have the internet at home, let alone a computer. So his class was going to have to heavily rely on the school’s technology to participate. Once our desire to have communication between our two classes was validated by curricular content, we began discussing different platforms we wanted to use. I was introduced to Twiducate by a teacher at my school and we began looking into using it. It did not require students to sign up with emails and it was very much a controlled learning environment so privacy was not an issue. Each week, Scott and I would post an opinion question on Twiducate and our classes would respond to it. But what was missing was the interactivity between them. They were not “communicating” with each other. They simply logged on, read the question, answered it and left without so much as glancing at what others had written. Exactly what we didn’t want! So Scott and I organized a live chat on Twiducate once we got halfway through the book. Aside from persistent infrastructure issues all schools deal with, we saw our students communicating more with each other! It was wonderful to see the discussions happening! A sample of the Chat between students. After the chat, we continued with our weekly questions. Some students began to respond to what others had written and some had just continued with what they were doing before. At the end of the novel study, Scott and I reflected on what went well and what needed to be tweaked. At the end of that school year, our Superintendent asked if Scott and I would present our Inter-School Novel study to the grade 7-9 teachers in Regina Public Schools at the opening conference. We knew then that we were on to something engaging. After the conference, Scott and I planned to grow this activity. This was going to be difficult now that I took on a new role and was no longer in a classroom. But I knew enough teachers that this project could continue. We chose a new book: Les bas du pensionnat (Fatty Legs in English) and grew the study by 2 other classes. And with the support and assistance of our Superintendent, he found us a day where we could access 4 guest teachers to relieve the classroom teachers so we could meet for a half a day and plan out this adventure! Unfortunately, the soonest we could meet was this past Thursday (December 5th) – talk about a time crunch! Here is some background about the book we chose. Les bas du pensionnat deals with the life of a young aboriginal girl who convinces her parents to let her go to a residential school because she desperately wants to learn to read. However, she was not prepared for how the residential school operates and the atrocities that occur to her. We knew it was going to be a heavy contented discussion with students and that we would need to some pre-teaching. So we would need to have to have a platform to allow students to share what they have learned and the emotions they feel when reading about the events that take place in the book. So here is where the Inter-School Novel study took on a new life. I began a Google Doc and shared it with all who were involved: the 4 teachers, the 3 consultants and our Superintendent. The Google Doc was our living document that could be added to and would record all that we were working on. I can provide the major themes of the document, but because it is a living document, it is constantly evolving as we add new ideas and finds. The first part of our document was our driving question: What is the impact of residential schools today and what will be the impact in the future? Knowing that a major amount of pre-teaching would need to be done, I created a Storify page that contains French material found on the Web depicting the impacts of residential schools in Canada. Teachers and students can access the information without having to sift through countless other pages that may not meet their needs. As the teachers and consultants identify more useful sites, I will continue to add it to the Storify page. Another digital aspect I wanted to integrate into this project was blogging. I felt that, with such heavy content being taught, the students should be able to share what they are learning. I had stayed in contact with Sue Waters from edublogs and we were both prepared to tackle this project. However, at the meeting on Thursday, I found out that all the classrooms were already blogging and were going to use what they already had as their sharing platform for new learnings. So, I was excited to see that the teachers were already blogging with their students and all of them have invited me to participate in their student’s blogging summaries. Another great connection that was made was that one of the elders-in-residence with Regina Public Schools grew up in a residential school. So, the classes are going to meet face to face at one of the schools to hear the teachings from the elder and are going to begin their pre-teaching activities together. All of us were in agreement that a face-to-face meeting would help ease communication between the classes. Another non-digital tool we are also going to use is picture books written by Larry Loyie. He wrote about the strong emotions, uncertainty and lack of choice he and his family went through the days leading up to him leaving for residential school. 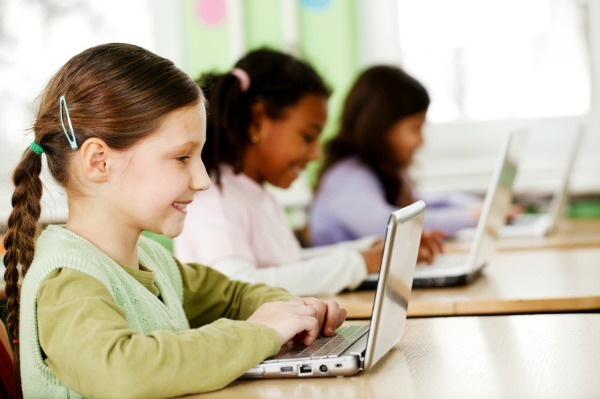 With using blogs and Twiducate as communication tools, one of our consultants, Monique Bowes, shared with us Media Smarts as a way to teach about digital citizenship. The nice thing about Media Smarts is that it is offered in French. I also mentioned that I am working on a workshop for digital citizenship for Grades 5-8 and would be willing to come out and do it with the classes in the New Year. This workshop is an interactive presentation where students will use Today’s Meet to discuss, question and connect with all who are participating in the presentation. At the end of the workshop, an assessment will be conducted using Socrative. Because there is no such thing as a cookie-cutter classroom, we all agreed that teachers would create their own in-class study for what they want their students to accomplish while reading the novel. I shared some examples of novel studies that other teachers have shared on-line through our Google Doc. Create an interactive image using videos, songs, images, text, etc. Even though this project is still in its development stages, I am very excited to be a part of the learning. I have a personal and professional connection with everyone involved and they are allowing me to help with this project both digitally and in the classroom. The big a-ha moment for me was, when we were wrapping up our planning session, everyone were already talking about next year and doing the sequel to the book the same way and who else we could include. I also received an email from Emma Graney of the Regina Leader-Post, who is coming in January to do an article about this project. Needless to say, to watch how much this project has grown has inspired me to make sure I keep my readers on this blog updated with the progress of this assignment. I also welcome any suggestions, comments and supports you may offer to enhance this project. My ultimate goal is to have schools from outside of our division (and maybe even province) working together on a similar project. Twiducate + Blogging + Inter-School Novel Study = One heck of a Project! I would like to start this post by saying a huge THANK YOU! MERCI! GRACIAS! to the amazing Sue Waters who presented to our eci831 class the other night to discuss blogging: the ins and outs and how tos. I hope she is proud of all the ways we learned to make our blogs much more enticing and informative. During Sue’s presentation, I was thinking about how to incorporate blogging into a major project I am currently working on in my division. This major project is also going to be my final project for this class. This post is basically my thoughts put to virtual paper so that I can begin a better outline. So what is this project? At the end of last school year, my Superintendent asked a colleague and me to put together a presentation to give at the Grade 7-9 opening PD session for all Regina Public School middle years teachers. The presentation was about our inter-school novel study we did together. Here is the summary of what we did. Scott Motlik teaches Gr. 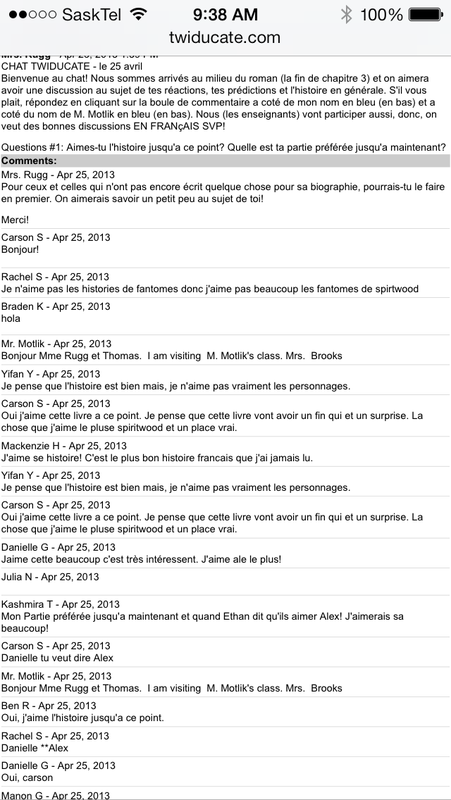 7/8 French Immersion at my fromer school (so I know and taught all of his students) and I was teaching a Gr. 7/8 French Immersion class in the same district but at a different school. We decided to have our students read “Les Fantomes de Spiritwood” by Martine Noel-Maw together. We used the website twiducate.com to communicate together on questions Scott and I had posted. 1. Only those invited to the chat we allowed to post opinions. No concerns over outside individuals, or unknowns communicating with students. 2. Students do not need an email to access Twiducate. Teachers add them and Twiducate gives them a password to enter the site. 3. Teachers could disable the “Delete and Edit” functions for students. Therefore no worries about cyber-bullying. Once you posted, we know who posted what and when and only the teachers could remove it. Scott and I split our classes in half so that I had half of his students and half of mine and he had the other half. Using Twiducate, we would post opinion questions about the chapters we were reading and the students would respond. They were able to discuss opinions with a different audience other then their usual classmates. They were also encouraged to reply to other student’s comments. Halfway through the book we placed both classes on Twiducate at the same time to do a real time chat. The students made predictions about the ending, who their favourite characters are and whether they enjoy the book or not. Aside from the infrastructure woes (that is not a new problem in our schools), it went off without a hitch. But with it being a trial run, and with all the amazing feedback Scott and I received from our presentation, we both decided we need to do this bigger and better! But because I am no longer in a classroom I had to take on another role for this project. Anyway, to make a long blog short (oops, too late), I am getting very excited to get this project rolling. I have all the main people lined up, all my experts ready to roll and now I need to take on my role and organize! I welcome any comments and feedback about what you think of this project. And please, if you want more information about Twiducate or the Inter-school Novel Study, don’t hesitate to ask. Sue said it is always good to incorporate a link in your blog for more information. So, here is a Leader-Post story about how a teacher in my school blogs with her Grade 1/2 class every week and has them tweet every day. And really, if they can do it, can’t we?